Info Chris Wallace is a Fox News anchor and host of Fox News Sunday. He has won many awards throughout his career in journalism. Wallace was born on 10/12/1947, a son of journalist Mike Wallace. He attended Harvard University, then became a reporter for WNBC-TV (NBC 4) in New York City (1975). In the 1980s, Wallace was the chief White House correspondent for NBC News (1982-1989). He served as weekend host of NBC Nightly News (1982-1984, 1986- 1987), then as anchor for Meet the Press (1987-1988). He has covered every presidential campaign and convention beginning with 1980. Wallace worked at ABC News from 1989 until 2003. He was senior correspondent for Primetime Thursday and alternate host for Nightline. Throughout his career, Wallace has earned numerous awards, including two Emmy Awards, the Dupont- Columbia Silver Baton, the Peabody Award, the Sol Taishoff Award for Broadcast Journalism, and the Paul White Award for lifetime achievement and service to electronic journalism from the Radio Television Digital News Association. Wallace has been affiliated with Fox News since 2003. He currently is the anchor of Fox News Sunday. He has covered all major political events of the past years, including such important interviews as the first interview of Mitt Romney after the 2012 election and several interviews with President Obama. Wallace has been a moderator of several presidential debates. In the 2007-2008 cycle, he moderated debates in SC, NH, and FL. In the 2011- 2012 cycle, he moderated several primary debates. 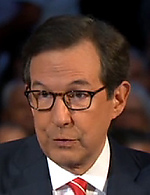 In the 2015-2016 cycle, Wallace was a co-moderator of the First Republican Presidential Primary Debate held in Cleveland.